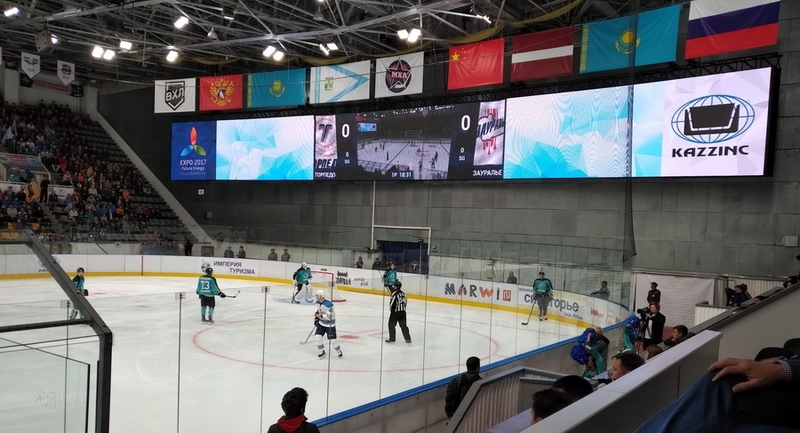 The recently upgraded Boris Alexandrov Sports Palace in Kazakhstan opened the new VHL season last Friday with a spectacular on-ice projection that took place just prior to the season opener between home team HC Torpedo against HC Zaural. The projection movie was prepared by the Colosseo creative content team and projected on the Ice with 4K surpassing resolution, all controlled by the Colosseo Single Media Platform. The venue underwent significant technology upgrades just before the summer, when Colosseo installed the world’s largest indoor Colosseo VISION HD LED display which is over 33 meters (108 ft.) wide, with 8 mm line spacing and 4K surpassing resolution together with the permanent installation of 3D mapping/projection technology on the playing surface. The installed technology had its premiere at the prestigious 2017 Woman’s Asian Club Volleyball Championship that took place in June this year, making the Boris Alexandrov Sports Palace the most advanced volleyball venue on the planet. Now, the venue has transformed into a hockey arena, providing the fans of the home team HC Torpedo with more entertainment than ever before! The Colosseo Single Media Platform oversees all digital content shown on the giant screen, including instant replays from the game along with the various entertaining animated graphic content and fan entertainment like KissCam or DanceCam, while the giant LED display provides generous advertising space for sponsors. Another new addition is also the presence of the Colosseo Video Goal Judge – a proven and reliable video analytics solution for ice hockey games, highly appreciated by officials in disputable situations. Boris Alexandrov Sports Palace has become one of the most modern venues in Kazakhstan, equipped with the latest technology and providing fans with the new level of infotainment and entertainment they deserve.